Getting inside a river or stream is the favorite of most anglers. One of the most important parts of this is being capable of accessing the areas of the current to cover the water effectively and just plainly get to the exact location where there are a lot of fish. How would you do that? The answer is – through wading. At https://under-the-open-sky.com/best-fishing-waders/ you will find the best waders reviews with which you can choose the best waders for you. You should also have at least a little knowledge of wading basics and safety tips. Here are a few. 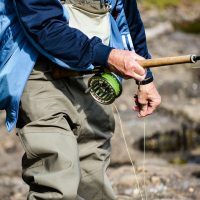 Many anglers won’t feel the need of a wading staff, but if you want to be a little more extra comfortable and stable while wading through those rapids, get yourself a wading staff. With its help you will be safer, be able to judge the depth of water better and access spots with less possibilities of swimming. 2. What are Your Wading Limits? Every angler is different and their comfort level in a current can vary a lot. The deeper the water, the more will be your buoyancy and more difficult wading becomes. Some anglers can’t go much further than water up to their thighs, while some others go chin-deep. It all depends on your level of comfort. Know your limits and stop well ahead before going too far. Remember that currents like streams and rivers keep changing constantly. By planning your route through the running waters, you can wade much better. If you have no plan, situations may arise when you are surrounded by very deep and unwadable waters. Be careful about dangers and other obstacles that may come in the way of your wading and plan accordingly. Plan ahead what you can do in the event of losing your footing and getting swept away. If you plan well where you would go and study the river currents, you can be much safer. This is necessary for reducing the force of the water pushing against you. If you face straight downstream or upstream against the current, it will put full force of the current against you. This will make wading significantly more difficult and much tougher to maintain your balance. The river current is continuously pushing against you. You can lean into it because of which it will push you naturally upright instead of downstream. Follow these tips and you can enjoy your wading adventure to the fullest.